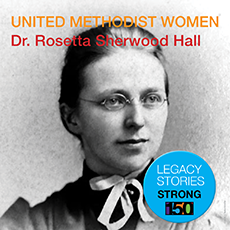 In 1890 the Woman’s Foreign Missionary Society sent Dr. Rosetta Sherwood Hall to Korea as a medical missionary. Ms. Hall became an educator as well when she began teaching a blind girl a form of Braille. She founded the Pyongyang School for the Deaf and Blind in 1909. Joining with a group of Korean doctors, Ms. Hall co-founded the Chosun Women’s Medical Training Institute in 1928. Ms. Hall served 44 years in Korea. She lost her U.S. citizenship after she married Canadian missionary Dr. William James Hall in 1892.